Say what you like about game developers in the ‘90s, but they at least knew how to name their games. Look at any list of releases from just about any year in that decade and you’ll find any number of punchy, pithy, interesting-sounding titles. Doom, Warcraft, Civilization - of course the fact that these games are all classics lends their names a certain familiarity and ease with which they roll off the tongue, but you’d have trouble convincing me that Command & Conquer wasn’t a genius name for the game that popularised the RTS genre. It’s three words and five syllables elegantly structured in such a way that they almost perfectly sum up the product they’re attached to. They’re catchy. They stick in the mind. They’re memorable, so much so that twenty years later just saying them will evoke fond memories of that opening GDI beach assault. They also evoke something that’s been a little bit lost in the intervening two decades; an attitude towards strategy that I wouldn’t exactly call more thoughtful or relaxed, but certainly slower. 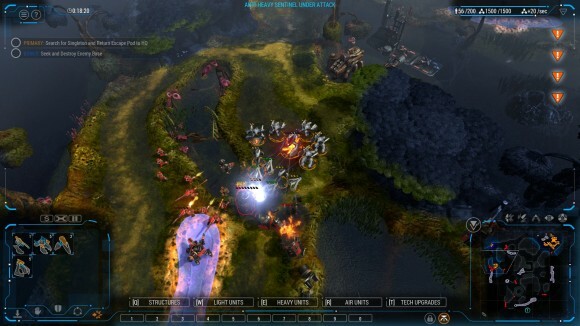 Starcraft popularised an emphasis on frenetic micromanagement that gradually became dominant throughout the genre, to the point where even the later C&C games aped it (to their great detriment), but there’s a lot of people out there who miss the older, more languid style of Command & Conquer, and would very much like it if somebody made a modern game in that now almost-retro style of RTS. I’m going to do something slightly more long-form here, both because I have insomnia and because the Red Alert series is something I remember through a rose-tinged nostalgic fog. I’ve mentioned before how watching Joe Kucan ham things up in Command and Conquer is as inseparable from my childhood as scraped knees in the playground are for normal kids. I was eleven years old at the time and had no disposable income, so my experience of it was via the highly convoluted method of the GDI disc being borrowed from one of my brother’s friends and played on a Risc PC - which my parents had bought in the charmingly deluded belief that it would be used for educational purposes – that could only emulate an IBM PC operating environment and consequently had no sound. I didn’t care. For somebody whose previous gaming experiences consisted of some pirated Atari ST games (the Atari ST was the poor man’s Amiga, although I didn’t know that at the time) and some stuff for the Archimedes that was coded by one guy working out of his bedroom, watching full-motion video featuring actual live actors intercut with primitive CGI was a damn-near religious experience, even if the actors were curiously mute.